When you move, there are items that demand a little more care than others—like your dishes. To make sure your grandma’s china gets to its next destination in one piece, you may want more than the Sunday paper and a few recycled boxes. 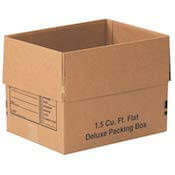 Below are our recommendations for the three best dish packing boxes for any mover on any budget. If you’re looking for box recommendations and tips for packing up those delicate wine glasses, head over to our best boxes for glassware piece. The Uboxes Dish Kit is designed to fit perfectly within the brand’s small box. It’s comprised of interlocking cardboard inserts that can be customized to accommodate any size of plate or bowl you’re packing and, once assembled, will evenly distribute any weight or pressure applied to your box. This means your dishes arrive intact at your new home. Uboxes Deluxe small boxes are heavy duty and durable. They’re strong enough to stand up to books or pots and pans with no difficulty. When combined with the Uboxes Dish Kit (there’s also a Glass Kit), Uboxes Deluxe moving boxes protect the prettiest of plates—like any fine china or expensive dinnerware you’re moving. This Home Depot kit is your one-stop shop for all your dish pack needs. A variety of box sizes and included packing materials like foam sheets and dividers make this moving kit ideal for moving medium to large kitchens and should provide enough flexibility to fit everything from crock pots to champagne flutes. We were initially a little hesitant to include this kit because it felt like overkill for the typical mover. However, Home Depot’s guaranteed return policy on unused boxes changed our mind. 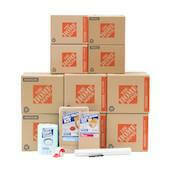 As long as you keep your receipt, you can return leftover boxes to any Home Depot near you. In our opinion, U-Haul is the best dish box option for the budget minded—whether you are renting a moving truck from the company or borrowing your buddy’s pickup. 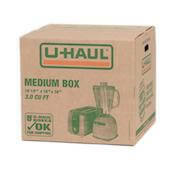 The medium box from U-Haul is well constructed, holds up to 65 pounds, and has handles for easy lifting and transport. What really set U-Haul’s boxes apart in our research, however, is the wealth of knowledge and experience that they come with. You could buy your moving supplies online or at your local hardware store, but you probably won’t get the chance to talk to someone with years of experience and dozens of moves under their belt in either of those venues. 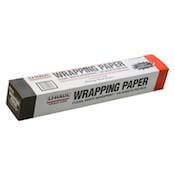 We recommend protecting your plates and platters with U-haul’s acid-free, ink-free newsprint packing paper. Always pack your dishes on their edge. If you pack them flat, they’ll be more prone to break during transport. Dish boxes are known in the industry as dish barrels. Dish barrels are usually a deep box with an insert that can be used to separate dishes and allow them to stand upright on their edge. In our research, we found that the best inserts had customizable configurations and also had a void in the center when assembled. This open space gives you an ideal place to pack your heirloom Ming vase or those signed Family Matters collectible dinner plates. When you’re packing your dishes, start with a sturdy, well-constructed box and a plethora of packing paper. Wrap your dishes well by placing them in the center of several pieces of packing paper and bringing the corners in and over. Then pack them standing on their edge—this is your best bet to keep your dishes from breaking during transit. We spent hours researching the best dish pack boxes for any mover on any budget. 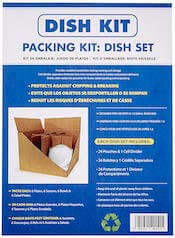 The dish pack system that offered the most protection was the Uboxes Dish Kit and the Small Box on Amazon. The best all-in-one solution was the Home Depot 10-Box Kitchen Moving Box Kit, and the most budget-friendly was U-Haul’s Medium Moving Box and Packing Paper. Whichever you choose, you can rest assured your move and your dishes will be well served. If you’re looking for more help packing, check out our Ultimate List of Moving Supplies.